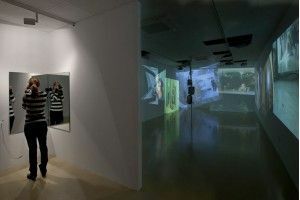 The exhibition Through the Looking Glass by Joan Fontcuberta gathers two works in which the artist uses resources offered by the internet . Titled Googlegrams and Reflectograms, these works propose to reflect on the importance and increasing use of images, the proliferation of artists, as well as the potential for broadcast and viral dispersion, all of which are growing exponentially with the use of social networks. The Internet has disseminated the notion of a universal and democratic memory , exhaustive and accessible to everyone, fulfilling the dream of the "noösphere" preached by Vernadsky and Teilhard de Chardin. The Googlegrams examine the extent to which this utopia is not so far away from becoming a reality. Currently, different softwares products make use of photomosaic, a technique of digital illustration used in design and advertising since the mid= nineties. A photomosaic is a technique by which an image-model is composed through a reticular structure of small image-models. At a certain distance we recognize the original, but a closer look allows us to appreciate that original is composed by a multiplicity of images. The photomosaic constitutes therefore a species of perceptive palimpsest. a relationship to be established (poetics, dialectics, politics, etc) between the search terms and the matrix image, and between the search terms and the images associated with them at the fixed moment of the search. The device mobilises, then, in an uncontrolled way for the operator, the logical accidents (polysemys, homonymy, superimposition of languages...) and the censorship and filters that the browser also surreptitiously imposes. Mirrors and cameras is a work which describes the panoptic and scopic character of our society : everything is given to an absolute vision and all of us are guided by the pleasure of viewing. In these photos the ludic and selfexploratory character prevails over memory. Self photography and the dissemination of these images through social networks is part of a seduction game and of the rituals of communication of new urban subcultures.